Apologies for the delay in writing some words to go with the picture shown here. While it is very easy to upload pics directly to this blog – especially with my wonderful new phone – writing the copy to go with it takes a bit longer. 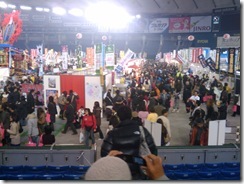 Anyway – I can finally reveal that the picture was taken at this weekend’s Tokyo Dome Matsuri, that took place at, er, the Tokyo Dome. In Tokyo. What’s a Matsuri I hear you ask? Good question. All regions of Japan, and often individual districts and city wards, have their own matsuri – a local festival to mark the passage of the year. 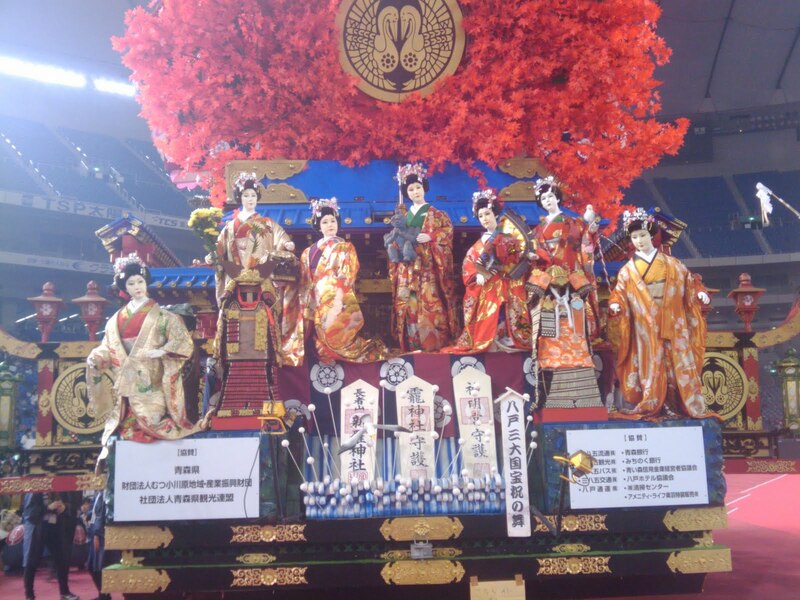 Every matsuri has its own traditions, often hundreds of years old. Likewise, every region of Japan has its own epicurean specialities – food, drink, arts and crafts. 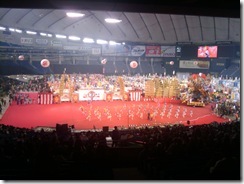 Some bright spark thought it might be a good idea to weave this whole cultural tapestry together into a single event and so the Tokyo Dome Matsuri was born. Basically, it’s a 4 day festival of Japanese folk traditions combined with an exhibition of regional food and drink from all over the country. In short – a brilliantly vivid and intense slice of Nihon no bunka – Japanese culture. This weekend was my last weekend in Japan for a while as I am headed back to the UK this week on business. Consequently, Big M and I wanted to do something a bit different. We’d heard about the matsuri from our friends A and Y, and we headed over to Suidobashi almost on the spur of the moment. Boy, what a fun afternoon. The first think that struck us was – it’s massive! When we arrived, there was a folk dance in full swing in the main arena. Behind that were crammed hundred of stalls selling every imaginable kind of produce. 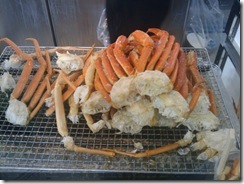 From Hokkaido we saw stalls selling kani – snow crabs that can grow to huge dimensions. These are small ones! Also from Hokkaido was ice cream, cheese and other dairy products. From Kyushu we saw dried fruits and wonderful cakes and pastries. We bought some spices and feasted on fantastic yakisoba and donburi dishes from all over the place. Last but not least, was the local beer. It’s not often you get to drink anything but the mass produced stuff like Kirin or Asahi. But some of the “real beers” being produced in Japan are as good as anything you’ll find anywhere in Europe. I am resolved to try and track down a few of these breweries upon my return in a few weeks. So, a fantastic day and some really nice memories to keep my spirits up over the next couple of weeks. To say I am not looking forward to returning to the UK would be a considerable understatement. If it wasn’t for the weather I think I could tolerate the prospect, but after such a hellish experience in the snow last year, the prospect of a re-run is filling me with dread. My brother in law joked that his friends refer to him as “the banana” – yellow on the outside but white on the inside. By the same reckoning, I think my nickname should be “Tamago” (Egg).